A lot of Apple news and rumors have popped up this week, so we’ve gathered them all together for you in one convenient place–dip in and imagine the future of iDevices. 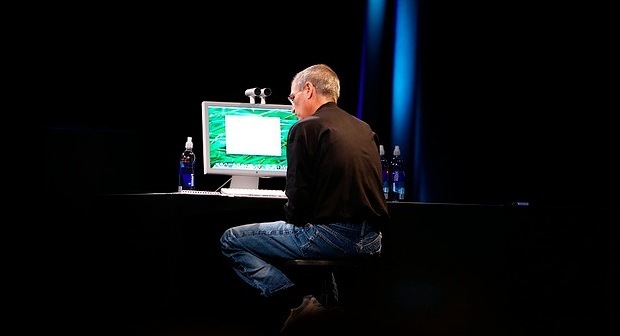 A lot of Apple news and rumors have popped up this week, so we’ve gathered them all together for you in one convenient place–dip in and imagine what Steve Jobs and Co. have been working on for the future of those iDevices. Apple released its new Thunderbolt protocol with the recent revamp of the MacBook Pro line of laptops–it’s a rebadged Intel LightPeak interface, just as many people had expected, but Apple surprised everyone with the format for the plug: A tweaked mini DisplayPort adapter that can also send power and data to peripherals like hard drives. We then wondered if it would appear on the iPad 2, only to be disappointed. But it seems Apple has plans for a change to the 30-pin iPod socket that’s now on the iPhone, iPod line, and iPads, which hasn’t changed in years. The firm just won a patent for a variation on its (already patented) design that also incorporates capacity for “high speed data connections” which include USB 3.0 and Thunderbolt-style mini DisplayPort connections alongside the more common array of connections that let Apple’s devices accept info, power, and spew out data and sound. 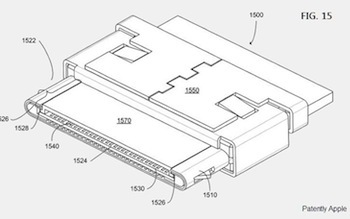 There’s even a “reduced height” arrangement, which marries with Apple’s other attempts to shrink the size of audio sockets–Apple has plans for even skinnier devices than the iPad, it seems. We’ve heard about plans for a touchscreen variant on the iPhone’s home button–but Apple just filed a patent for a “smart” bezel for its devices that puts various touch controls around the edge of the display of a device like the iPhone. Actually much more than an “extended” touch interface, which is roughly what the Palm Pre’s “gesture area” is all about, the display relies on printed, segmented electroluminescent units (or similar tech) that would be hidden when not activated. These units would display additional info when needed–we’re thinking games controls, an improvement to the awful messaging/alert system iOS uses, and display-wasting info like battery life bars or a clock. Apple even imagines they could appear on the back of the iPad. Apple touts the iPad as an ideal e-reader device, and is proud of the high tech trickery that makes its iPhone and iPad displays pleasant to use. As long as you’re in a not-too-well-lit location that is, because the back-lit LCDs just don’t do well in direct light. That’s where e-ink excels (and some think it’s better for reading e-books on too)–which is why displays like PixelQI exist as a blend between the two techs. But Apple imagines that there’s a much cleverer way to do the same trick as a PixelQI screen without it working in only one or the other mode, and has filed a patent for a mixed e-ink/LCD screen with an area-selectable backlight that adapts on the fly to the display. Say you’re reading an e-book–the new screen could have the majority of the display setup as a daylight-friendly e-ink unit, with just controls or alerts as glowing LCD segments. As a bonus this would seriously extend the unit’s battery life too. We want it now. One thing that’s in the forefront of millions of shareholders’ and Apple observers’ minds is: When will we see an iPhone 5? Some thinkers hint at later in the year–and an insider has independently hinted to Fast Company that this may indeed be true. But just today, an analyst with Ticonderoga Securities suggested to his investors that his checks with Apple’s supply chain make him “question a delayed launch” and the iPhone 5 may arrive in the June-July window as expected. 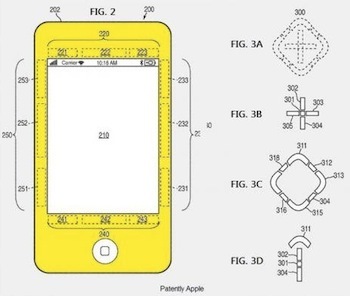 If he’s right, we can expect to see a flurry of patenting and leaks in the next several weeks–and while some of it may be off the mark, some of it absolutely will pop up in an iDevice sooner or later. And as a trend-setter, Apple’s in the position of blazing a trail that others are following–this is how your future smartphone/tablet/PC may work even if it’s not from Apple. As an example of this effect, you remember Steve’s war on Adobe Flash? It’s working–Flash use on”top websites has been dipping. Image via Flickr user acaben.